An absolutely awful movie, the initial premise is only moderately interesting, and then this one goes nowhere after that. 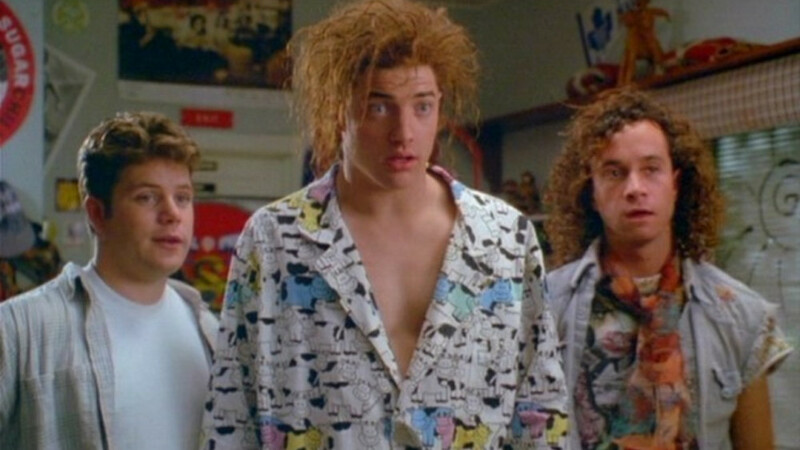 Encino Man is a pretty terrible film. First off, you’ve got Pauly Shore in an incredibly annoying performance, doing that thing where he slows down words and makes up words. Then you’ve got a story about two guys digging up a caveman, that goes nowhere. And then you’ve got the fact that this movie hits every cliche in the book, except for the ones that might lead to something of a real plot. In other words, you’ve got all the usual character tropes like the bully and the girl who is with the bully, who our hero wants to get with, but the cliched ideas that would at least point this movie in the direction of an ending or a path to go on, are nowhere to be found. The result is a complete, unfunny mess. The only thing decent here is the original idea about the guys digging up the caveman. After that, it’s all downhill. 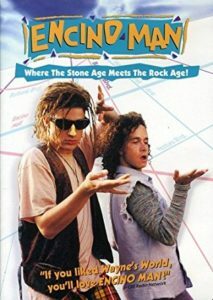 Encino Man is a movie from the early nineties that somehow ended up being a hit. It’s a film that shows the collective movie going population wasn’t exactly the brightest back then. Sure we embraced some comedies that would live on as nostalgic gems, like Wayne’s World, but we also, for some reason, embraced Pauly Shore (at least for a little while,) and Encino Man was his debut film. It’s easy to say, “what the hell were we thinking,?” but at least Shore’s one note character (and I mean that he plays the same character in every movie, and that this character only has one note,) was short lived. It was this movie, Son In Law, and then after that, Shore was already on his way out, with movies like In The Army Now and Bio Dome. The only thing unfortunate is that it didn’t happen sooner, and that for a while, we actually considered Encino Man to be a decent movie. The movie is about digging up a caveman in your backyard. It’s not the worst idea for a film. In fact, that general premise is the best thing about the movie. Two kids, Dave (Sean Astin) and Stoney (Pauly Shore,) are trying to dig a pool in their backyard. They’re just making their own pool. And suddenly Dave hits a huge block of ice. Turns out there’s a person inside. This is the first and last original idea the movie has. Dave shows Stoney who wants nothing to do with this. But Dave convinces his friend that this discovery can make them rich. He talks about things like how they’ll be able to watch as much Jeopardy as they want. And Stoney does the Pauly Shore Weasel character (the character that he plays in every film,) saying single words by slowing them down to pronounce each syllable. Things like Jeop-ar-dy. It’s incredibly annoying. To make it worse, this character makes up his own words, saying things like, “Thanks for the grindage,” referring to food. And not only does Dave put up with him, but so do Dave’s parents, who have Stoney over for dinner, and apparently have him over most nights of the week. Not that the parents are so bright in this movie. While I’m a big fan of the actor Richard Masur (The Thing, License To Drive, Risky Business,) here he is playing an absolute idiot. When Dave tells his parents that this caveman they dug up is actually an exchange student staying with them, and that he told them about it weeks ago, the parents say they don’t remember, but go along with it anyway. In fact, they believe Dave that he did tell them about it, and that they just forgot. The father even tells his wife that he thinks he remembers Dave telling them about it. So Dave and Stoney dig up the caveman (who they call Link, played by Brendan Fraser,) and then they go to Schoo. When they come home, the block of ice has melted and Link is gone. Turns out he’s in Dave’s room trying to start a fire. And the boys now decide to let him live with them (with Dave and his family,) and to take him under their wing. Forget about the whole safety issue for a moment, but what about that original idea to male money off this. That was how Dave convinced Stoney to be a part of it, yet it never comes up again. If they had turned this into something interesting, such as getting Link interviews or getting themselves a gameshow or something, this could have been fun. But instead, the movie forgets about the making money idea, and is content to just be about a caveman in highschool. The other girl here is Robyn, (played by Megan Ward,) and wouldn’t you know it, not only is Dave trying to get her, but she’s also the girlfriend of the most popular guy in school, who’s a jock. and also the biggest bully. It’s as if they were trying to hit every cliche imaginable. And they did. On top of the lack of meaningful women characters problem, (and yes, there are plenty of movies that have that problem, but with this movie it’s not even trying or trying to hide it,) there’s also the fact that nobody notices there’s anything strange about this guy, Link. A class that Dave and Stoney attend at school is studying evolution and cavemen (as can be seen when they go on a field trip to a first man exhibit,) and yet nothing to connect to Link ever comes up. And when Link takes a bit out of a frog in science class, nobody sees or says anything. Encino Man is an absolutely awful comedy. There’s nothing funny about it, and the plot is pretty terrible. The premise about digging up a caveman is good, but everything that follows is as if the writers put no thought into it at all. At one point, Dave gets angry that Link is getting more attention than him and tries to leave Link on the side of the road. Really? Even if you’re angry with the guy, you still help him get somewhere safe. You drop him off at a homeless shelter or something. But that’s the kind of logic that is in this movie. None. And Pauly Shore’s character gets to the point where he’s nearly intolerable and definitely cringe-worthy. This is some pretty bad stuff.